The Hollywood glitterati clapped and cheered as Jared Leto accepted his Oscar for ‘Best Supporting Actor’ in Dallas Buyers Club. With a catch in his throat and a tear in his eye he stood at the rostrum and paid tribute to his mother, his colleagues, his production company and everyone associated with the film, before saying, “To all the dreamers out there around the world watching this tonight in places like the Ukraine… I want to say we are here and as you struggle to… to make your dreams happen, to live the impossible…we’re thinking of you tonight.” The Hollywood Dream Factory has spoken. 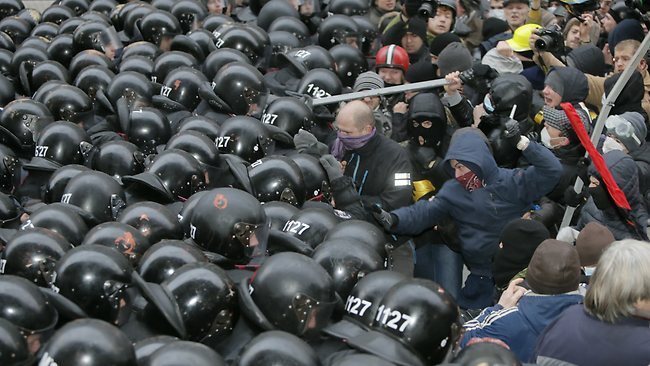 Ukraine is a victim, and the demonstrators In Kiev are proto-heroes. The cameras cut away to an image of Bono in the audience, as he joined in the applause and nodded wisely, conferring the stamp of liberal approval on Jared Leto’s analysis of what is likely to be the most serious international crisis of the first quarter of this century. No one would seek to justify the invasion of a sovereign state by another; surely we have seen where that leads us in Iraq and Afghanistan, but international relations are never straightforward and do not lend themselves to vacuous explanations by people who know little or nothing about the political or historical issues involved. So, with the greatest respect to Mr Leto, and Bono and the Academy of Motion Picture Arts and Sciences, there is value in looking at what is happening in the Ukraine. First and foremost, this is not an East European version of the Arab Spring. Ukraine is, and has been for many years, a profoundly corrupt country where the rule of law is barely observed. Transparency International is a highly respected international research body which examines economic and governmental corruption across the globe. They rank 177 nation states according to a raft of indicators and rank them in order of probity, honesty and freedom from corruption, with Sweden at number 1 and Somalia at number 177. Ukraine currently stands at a lowly 144th, the highest ranking it has ever achieved. This was certainly the case when the recently ousted President Vyktor Yanukovych held the reins of power, but was no better when his predecessor Vyktor Yushchenko was President from 2005 to 2010, nor when the cover-girl of Ukrainian politics, (now paraded around Independence Square in a wheelchair), Yulia Tymoshenko, was prime minister. All presided over a collapse of the Ukrainian domestic economy and a kleptocracy which was the scandal of Eastern Europe. Nor should anyone blithely assume, as liberal dupes in the West are only too prepared to, that the demonstrators who drove Yanukovych from power are all downtrodden heroes fighting for basic democratic rights – many have much more unsavoury credentials. There is an enduring strand of neo-Nazi fascism which has always been strongly represented in Ukrainian politics and has taken a leading part in the Kiev demonstrations. Visible everywhere is a political formation known as Pravy Sektor (Right Sector), which is essentially an umbrella organisation for a number of ultra-nationalist right wing groups including supporters of the Svoboda (Freedom) Party, Patriots of Ukraine, Ukrainian National Assembly – Ukrainian National Self Defense (UNA-UNSO), and Trizub. All of these organisations share a common ideology that is vehemently anti-Russian, anti-immigrant and anti-Jewish, among other things. In addition they share a common reverence for the so called Organization of Ukrainian Nationalists led by Stepan Bandera (1909 to 1959), the infamous Nazi collaborators who actively fought against the Soviet Union during the Second World War and engaged in some of the worst atrocities committed by either side. Bandera’s followers enlisted in the Waffen SS, served with Adolf Eichmann’s Einsatzgruppen murder squads in Nazi-occupied territories, and were a main component of the personnel operating death-camps such as Treblinka, Belzec and Sobibor. In their thousands, they fought on the eastern front against the Soviet Union after 1941. This is the same Bandera who, in January 2010, was awarded the posthumous title of ‘Hero of the Ukraine’ by President Yushchenko. It is no wonder that Moscow has suspicions about the political motives of those that have seized power in Kiev. It is also important to remember that Ukraine is a unitary state with a very brief history, not some bastion of Eastern Europe that has been with us for centuries. Prior to 1954, when Premier Khrushchev, (for reasons of organisational expediency in what was then the USSR), re-drew the borders of Ukraine to include the Crimea, Ukraine had no claim to the peninsula, nor Odessa or the coal-mining areas of the Don valley around Donetsk and Kharkiv. These cities and most of what is now claimed as Eastern Ukraine were, for centuries, part of Russia proper, with Russian being the lingua franca and with strong societal and familial ties to Russia. The vast majority of the population did not then, and still do not consider themselves to be Ukrainian in any sense whatsoever. Putin is viewed with suspicion in the West because he fulfils the stereotype of a bullying Russian leader that many remember from 30 years ago. With his expressionless eyes and KGB background we are pre-programmed to believe that he is evil personified. When he says that Russia has every right to protect the interests of Russian-speakers in the Crimea and elsewhere in the Ukraine, the liberal press in the UK or the USA, France or Germany, is prepared to scoff while it seeks to portray the Kiev rioters as heroes, beating on the door of Western Europe and pleading to be rescued from oppression. The Russian state has its own agenda and there will surely be elements that are less than pure about what is planned, but that should not close our minds to the fact that an orderly Russian occupation of Crimea (and perhaps the whole of Eastern Ukraine), might be infinitely preferable to a corrupt and brutish regime whose political tap-root is Nazi ideology and the racist philosophy of the death camps assuming power in Kiev.